"The Oracle of Delphi and The Delphic Commandments (explanations, symbols, Plato and Heraclitus)"
“Has no one ever tried to translate the full list of commandments”? Yes, there have been a couple of attempts to do it yet, they failed miserably; or in best case they are problematic. Consequently, these attempts failed to successfully deliver the exact meaning of the commandments to a non-native Greek speaker, neither were they able to deliver to you, Delphi’s wisdom. Mainly for two reasons: either they tried to translate the commandments word-by-word and got lost in translation (providing you with some awkward translations) or the previous translations were not able to bridge the meaning of idioms of, not two but, three languages; namely, Ancient Greek, Greek and English. This resulted in altering the essence of the commandments. One, we translated everything from Ancient Greek to Contemporary Greek. Then, we proceeded by comparing the idioms of the Ancient Greek and the Modern Greek languages. Two, afterwards we proceeded by translating everything into English. Then, we compared the meaning of the idioms of both the English and the Modern Greek languages. Three, we made a final check by directly comparing the idioms, and figure of speeches, of Ancient Greek and English. If everything was done correctly, the meanings should match; and they did! Four, every time we considered it necessary we followed a “loose translation” approach rather than a “word-by-word” approach because our goal was to retain the essence of each commandment accurate, when translating it to English! Five, every time we considered it necessary we added additional explanations (in brackets) so as to help you to get a deeper understanding of each commandment. For all the aforementioned reasons, we strongly believe that we have accurately translated all commandments of Delphi. Usually, the Ancient Greek priests did not give advices nor did they hear any confessions but they were primarily focused on fulfilling their duties (you know, praying to the gods etc.). The ethical education and guidance, of the common citizens, although it started off with their educators (pedagogy) eventually it continued in the Oracles. 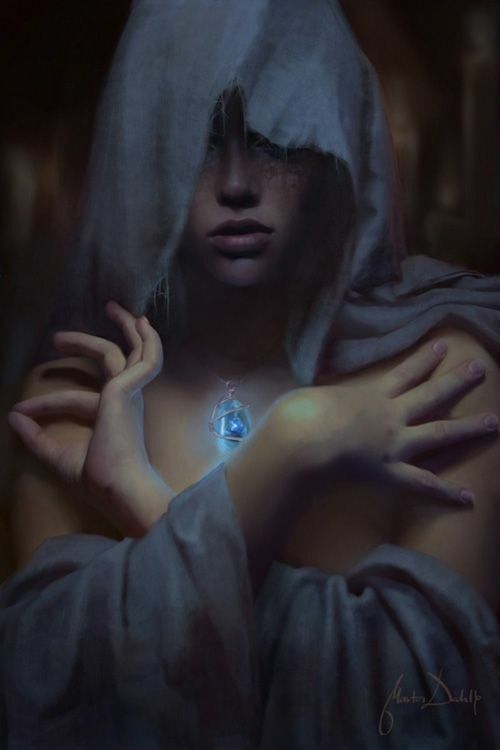 The Oracles, besides foretelling future events (due to “godly enlightenment”) they also provided a plethora of commandments that acted like advices for various circumstances of everyday life. 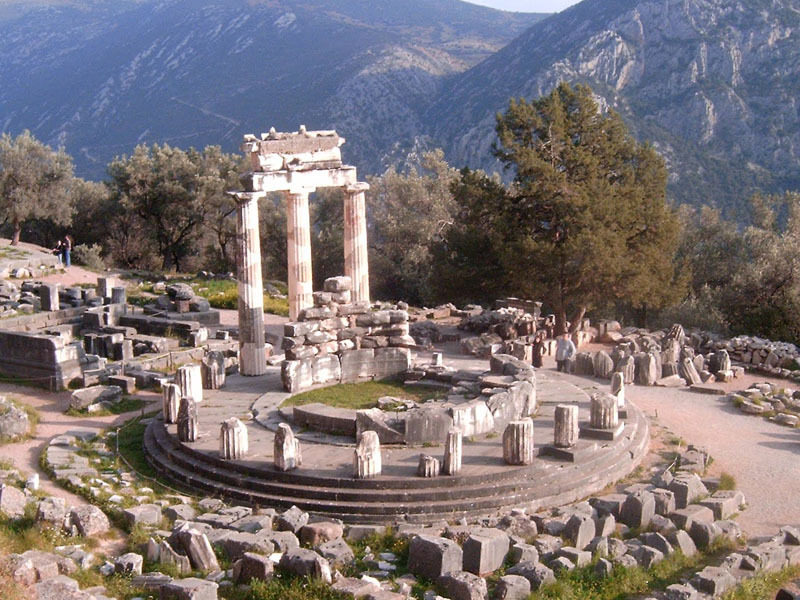 The top position amongst Oracles was held by the Famous Delphi. 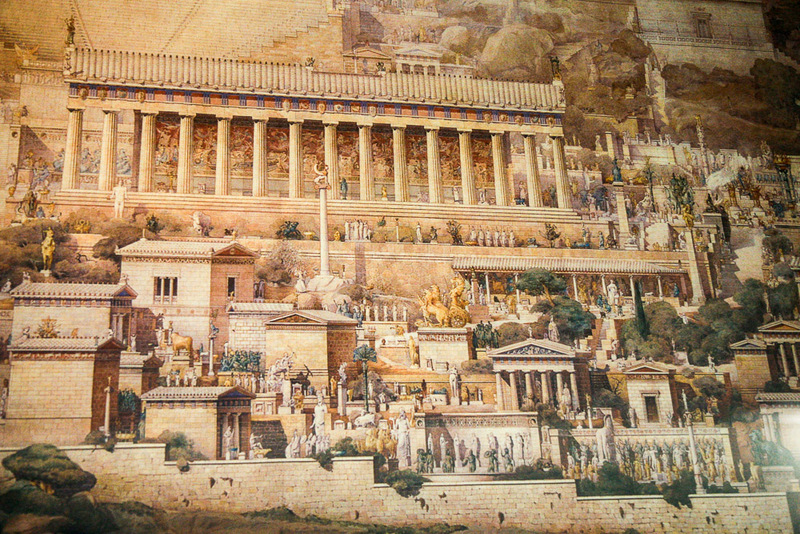 Delphi’s commandments were written on the walls of a small Temple, right before reaching the main Temple of Apollo and on columns which were placed around Apollo’s Temple. On the pediment of Apollo’s Temple were written the three most famous of Delphi’s commandments; which could be easily seen by the visitor while approaching the temple. At the centre-top, and between the aforementioned two: “ΕΝ ΔΕΛΦΟΙΣ Ε” or (ΕΙ); Plutarch, the famous priest of Delphi, wrote an entire treatise by exploring the long-lost meaning of that commandment. In his treatise, Plutarch, proposes various explanations of the commandment “ΕΝ ΔΕΛΦΟΙΣ Ε” or (ΕΙ). 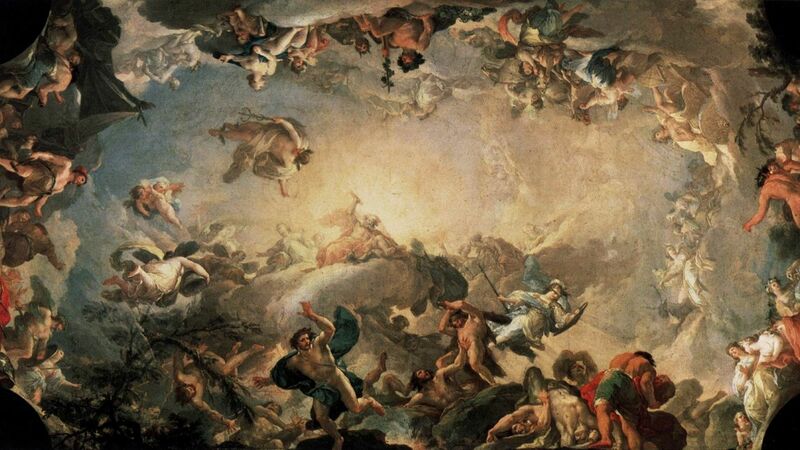 “ΕΝ ΔΕΛΦΟΙΣ Ε” is connected, through holy arithmology, with god Apollo himself or with the Pythagorean number, the first and absolute cause of everything. A final proposition is that through the letter Ε god welcomes the visitor by “saying”: ΓΝΩΘΙ ΣΑΥΤΟΝ = Know Thyself. The visitor replies: “EI (You are, You exist)” and through his reply the visitor acknowledges a) the existence of the god Apollo and b) that the god “Is One (EI EN)”, because A-pollo (A-ΠΟΛΛΙΝ) - is not meant for the many (the uninitiated people). Moreover, the three main commandments of Delphi form a harmonic triangle that also explains the meaning of "Ε", or "ΕI". In other terms, the state of “EI (You are, You exist)” - at the top of the triangle, can only be obtained by attaining self-awareness (ΓΝΩΘΙ ΣΑΥΤΟΝ = Know Thyself) and by following the middle-road, aka acting in harmony and in balance (ΜΗΔΕΝ ΑΓΑΝ = Nothing in excess). The two corners of the triangle, when connected, meet at the top - “ΕΝ ΔΕΛΦΟΙΣ Ε” or (ΕΙ); this is a simple example of what is known as holy geometry. Finally, which also is another example of holy geometry, the aforementioned explanation can be witnessed in the letter Ε. You have 3 horizontal lines, which represent the three main commandments. Once the individual is able to complete the 2 base-commandments (or requirements), the person is able to reach the third commandment (the third horizontal line); which in turn makes the individual an enlightened one – represented by the vertical line that connects all three horizontal lines, and thus forming the letter Ε.
Cleobulus of Lindos, Solon of Athens, Chilon of Sparta, Bias of Priene, Thales of Miletus, Pittacus of Mytilene and Periander of Corinth. 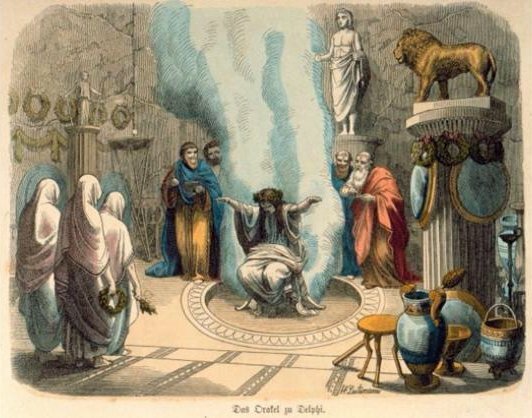 Overall, the Oracle of Delphi did play a vital part in shaping the ethos of the Ancient Greeks, based on the model of: ΓΝΩΘΙ ΣΑΥΤΟΝ = Know Thyself, ΜΗΔΕΝ ΑΓΑΝ = Nothing in excess; which lead to the individual’s enlightenment "ΕI". To summarize, the Delphic commandments were small sentences – consisting of two to five words, yet filled with wisdom; aiming to provide advices, and instructions, to the people so as for them to live in virtue. When all the commandments are put together they form, by themselves, an entire ethical system. 16. ΦΡΟΝΕΙ ΘΝΗΤΑ = Think as a mortal (or think as it is befitting of a man, and not as a god) - The commandment basically tries to tell us to be humble and to get off our high horse. 147. ΕΠΑΓΓΕΛΟΥ ΜΗΔΕΝΙ = Do not order anyone (the essence of this commandment refers to the following esoteric rule: do not intervene with anyone’s free will – aka respect peoples’ free will, thus, do not force them to do things they do not want to do). What do you think about The Full List of All Delphic Commandments?